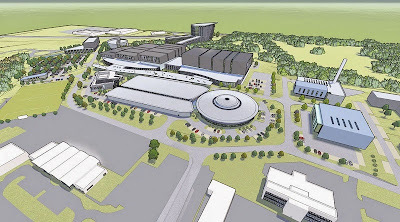 rotherham business news: News: Masterplan submitted for "AMRC 2"
News: Masterplan submitted for "AMRC 2"
The University of Sheffield has submitted a masterplan for a new advanced manufacturing campus based on the success of its Advanced Manufacturing Research Centre (AMRC) with Boeing. Located on the Advanced Manufacturing Park (AMP) in Rotherham and a partner in the HVM Catapult (the government's strategic initiative that aims to revitalise the manufacturing industry), the AMRC focuses on advanced machining and materials research for aerospace and other high-value manufacturing sectors. It is a partnership between industry and academia, which has become a model for research centres worldwide. In 2014 the institution signed a deal to secure 50 acres of land at Sheffield Business Park, paving the way for the expansion of the AMRC and building on its success on the AMP, where it already operates from 300,000 sq ft of accommodation within seven separate buildings. With space at a premium on the AMP, construction is already well underway on the first project on the new site - the £43m Factory 2050 that will be the UK's first fully reconfigurable assembly and component manufacturing facility for collaborative research. Now plans have been submitted for 46 hectares of employment land on the former Sheffield Airport site, off the Parkway between Rotherham and Sheffield, to create the AMRC2 Campus. 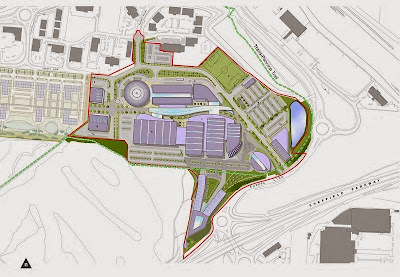 Drawn up by Bond Bryan Architects and DLP Planning consultants, it includes 1.3 million sq ft of buildings - 860,000 sq ft for advanced manufacturing and research, 670,000 sq ft for a residential training centre and conferencing, and 16,000 sq ft for outdoor and indoor recreation. It is designed specifically to have a "campus" feel "which encourages cross fertilisation of ideas and work. The value to the University and more importantly to the business and partners that the University works with will be significantly enhanced." Support amenities including office space and elements of retail may also be included but these would be of a scale to support the overall function of the campus and be ancillary in nature. New research buildings include the proposed £30m National Material Institute, part of the Sir Henry Royce Institute for Advanced Material Science, announced in December. Anticipated projects also include a £20m Fast Make Centre of Excellence were prototypes move to manufacture within months, and a £30m Energy 2050 development - a world-leading hub of excellence set up to address the "trilemma" of making energy more affordable, secure and sustainable. On the AMP, the next developments for the AMRC include a £7m extension of the Cti facility so that it can become the only place in the UK that can produce large scale titanium castings for the next generation of aircraft. It is also hoping to double the size of its AMRC Training Centre. In the same way Rolls-Royce has been attracted to the AMP, the new campus is expected to attract leading manufacturing companies to locate the the area. The AMRC has signalled its intentions to double its turnover to in excess of £80m over the next five years and to play a key part in the ambitious plans announced earlier this year by Sheffield and Rotherham Councils to create the first Advanced Manufacturing Innovation District in the UK. The plans cover areas of previously developed land and involve the demolition of airport buildings but they will also need to prove the case for special circumstances as the scheme proposes a significant amount of development within the Green Belt. The development could lead to the creation of 1,494 – 1,881 jobs directly related to the proposal and an annual direct operational contribution of £58.9m - £74.2m in GVA (a measurement of an area's economic output) to the local economy. The plans state: "The development at Sheffield Business Park of the AMRC Campus 2 has already attracted significant interest from partner organisations nationally and internationally. The University anticipates that this interest will, just as with Rolls-Royce, develop into significant investments for manufacturing, employment, and gross value added to the local, regional and national economy. "The global renown of the University's AMRC activities indicates the potential for AMRC2 Campus to be a prestigious development which contributes to civic pride and most importantly significant investment in manufacturing."